I am a very impatient person. I just hate to do things that take too long. It still baffles me how I like to decorate cookies because of all the time spent waiting on the cookies to dry. Go figure. Somehow decorating cookies centers me I guess. Cakes, on the other hand, are a different story. On the few occasions when I make cakes I want them to be done quickly. Today I’m sharing with you how I like to ice a cake. Personally I don’t think there is a right or wrong way to ice a cake (cake experts might gasp right now). I think it comes down to finding what works for you. Traditionally you should level your cake and then dam and fill it. Then you would crumb coat it and allow it to settle before doing your final coat. This is how I like to do it. I level my cake and then I dam it and fill it. Next, I squish the cake down pretty firmly for quick settling. Then I take some icing with an offset spatula and firmly press it into the sides of the cake to prevent air pockets from forming. Now I’m ready to get on with the show and ice away. I put a huge glob of icing on top of the cake and then using an offset spatula I spread it around & let it start falling over on the sides. Then I ice the sides and use my spatula to lightly remove excess icing. Next, I’m ready to get this cake smooth. I use a bench scraper to gently start removing icing from the sides of the cake. I go around and around removing small amounts of icing until I’m satisfied with how the sides look. In case you accidentally take too much off then just add more icing and smooth again with the scraper. As you can see a small lip formed on the top of the cake. I take my scraper and start smoothing it down. I’m not the best at this step but I do it well enough for my liking. I’m not trying to be a professional. After I get the top where I want it I clean up my board and then leave the cake to sit for about 10 minutes so the icing crusts over. Oh yeah, I forget to mention that my icing is a crusting buttercream. After about ten minutes I gently touch the cake and if no icing is coming off on my finger then it’s ready for the final smoothing. 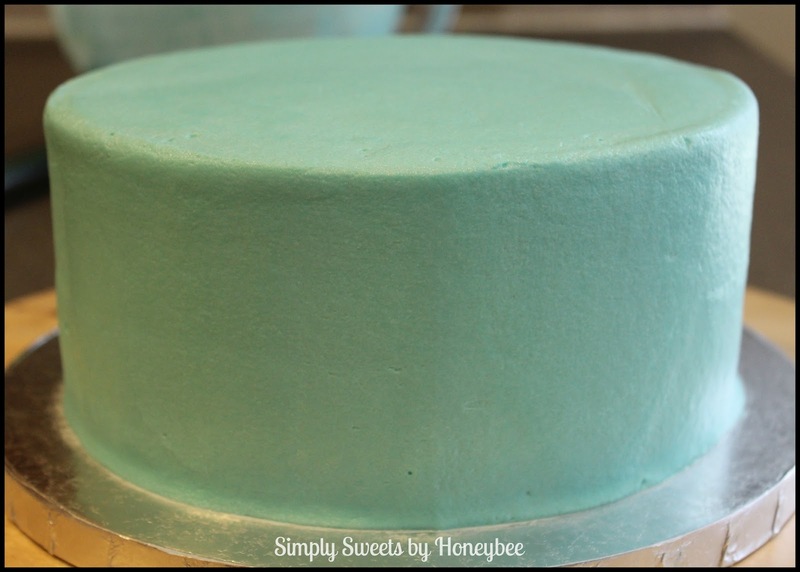 I use a Viva paper towel and a fondant smoother to smooth the tops and the sides of the cake. Smooth away until you’re happy with it. You may have noticed a crumb in the icing. You can gently remove it with a toothpick and then smooth over the spot. If you have several crumbs it’s okay because you can do some creative decorating to cover them up. This is what the cake looks like after smoothing. Not bad for bypassing the crumb coat. This is what works for me. Here’s the final cake all dressed up. Thanks for stopping by! I’ll be working on some interesting cookies next. i have such a hard time with cakes. this will help. I’ll do them for my kids – no pressure, but would have such a hard time selling them. i think i need to be more generous with the icing. Cakes are so stressful to me. That’s why I only do them for family & friends. They are okay with them if they are not perfect. I would never sell a cake to a stranger. No way! I’d probably end up in the hospital with a severe panic attack. I’ve had cakes bring me to tears and I tell myself that I’m never going to do them again but then I get over it and try again. Oops I forgot to mention that the amount of icing gave me so much trouble when I first started doing cakes. I always used too little and I kept getting so many crumbs. After a lot of trial and error and a few choice words I have finally gotten comfortable with this method. I find it easier to take icing away gently than to try to add it. With a thick coat of icing between the cake and the spatula you don’t touch the cake and avoid crumbs. I did get one though. LOL! Thanks for sharing your tips. No matter how long you’ve decorated, there’s always a trick to pick up along the way from someone else! Melissa, I swear we must be sisters! Maybe it’s in the name…Patience in decorating is so hard for me…But I am slowly but surely learning the art of it. Cute post. Thanks! I am quite the perfectionist too & I don’t like a lot of what I make. People say I’m crazy & I guess I am. I just can’t help it. Instead of seeing the beauty I see the flaws. I got the cutter from Copper Gifts. For some reason I cant paste the link. 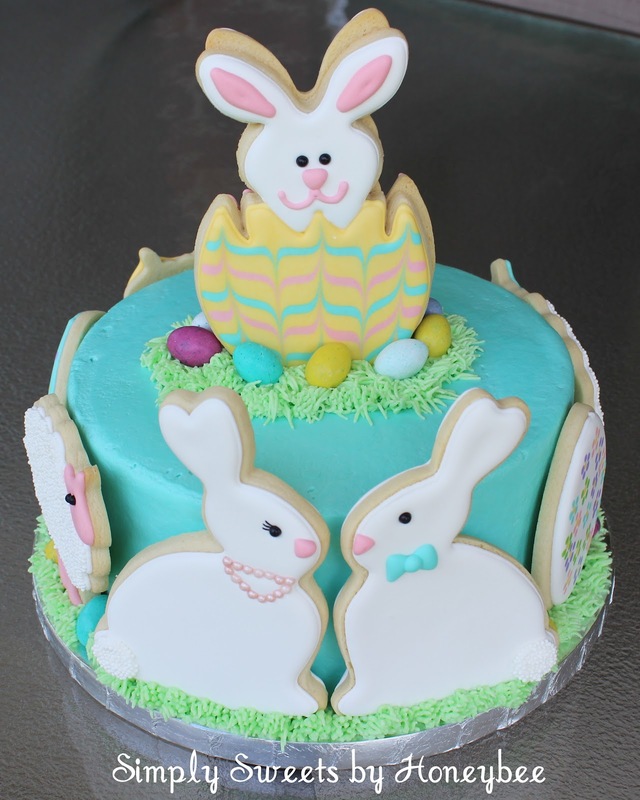 It’s item # 5205 bunny in egg cookie cutter by SweetDaniB. Thanks Carol! Glad you found the cutter. You will love it. Copper cutters are not cheap but they will last forever. Just so you know I couldn’t do this to save my life! Hi, this is such a great idea. 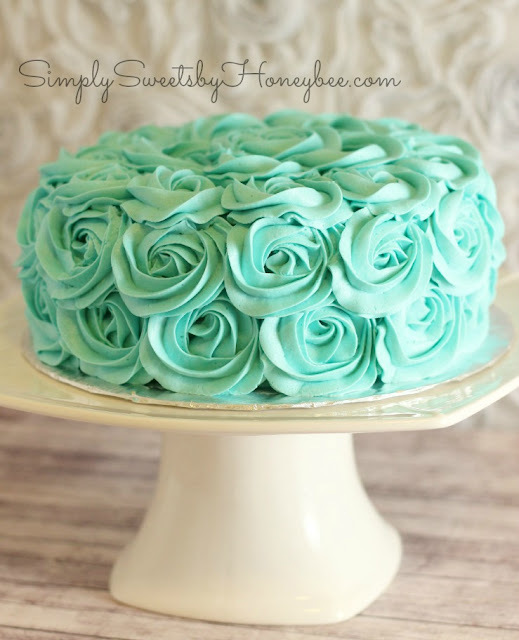 What is the difference between crusting buttercream and a normal buttercream? Oh thanks so much! Saves me the trouble of putting in the freezer. I took my cake decorating course from a bakery/baker’s supply store. They used your same method. No crumb coat. No freezer/refrigerator. They sell probably 200 cakes a week. They don’t have time for those extra steps. Hi Melissa, I’m going to bake a cake for my friend’s birthday next week and would like to only use frosting for the decorations. I find your tutorial very helpful and am going to practice this weekend. It’s so great people take the time to teach and help others. Hi Melissa, I’m going to bake a cake for my friend’s birthday next week and would like to only use frosting for the decorations. I find your tutorial very helpful and am going to practice before the big event. Thanks! Hello! I love love love making cakes, and I really like your ideas. However, when I make cakes there is a dome at the top. Is there any way you know of that could help me to bake a cake with a flat top? I know the cool wet towel method, but I was just wondering if there was another way. Thanks! I’m really inspired by your post about frosting cakes and want to try my hand at your technique. However, I’m unfamiliar with the term “dam” the cake prior to frosting. Please explain to me what this means. Also my cake layers don’t look as nice as yours when they come out of the pan. They are usually lopsided and not as high as yours.